We live in very worrying times. In little over three weeks the UK will have a general election. The democratic process is vital to improve the human condition, yet globally it is under threat like never before. A free press is also fundamental. Today I want to highlight a few of the people I see as heroes in the struggle to protect British democracy. Carole Cadwalladr has written some of the best investigative journalism since the days of Woodwood and Bernstein and the Watergate investigation. In this important article she shows the corrosive effects big data, big money and some very unpleasant people seeking to influence, and to undermine, the democratic process on a global scale, including the Brexit referendum and the election of Donald Trump. The Brexit referendum was dominated by big lies. For me the one person to emerge as a hero from the whole process was Gina Miller. She is now busy organising a tactical voting campaign. More United, Compass, Make Votes Matter are three of the many organisations working to try and get greater cross party cooperation to improve the functioning of British democracy, and all very much worth supporting. What is unfolding in the constituency of South West Surrey is particularly interesting. It is the seat of Health Secretary Jeremy Hunt who is being challenged by the excellent Dr Louise Irvine of the National Health Action Party. I blogged before about what is happening to the NHS and this constituency contest encapsulates that bigger struggle. 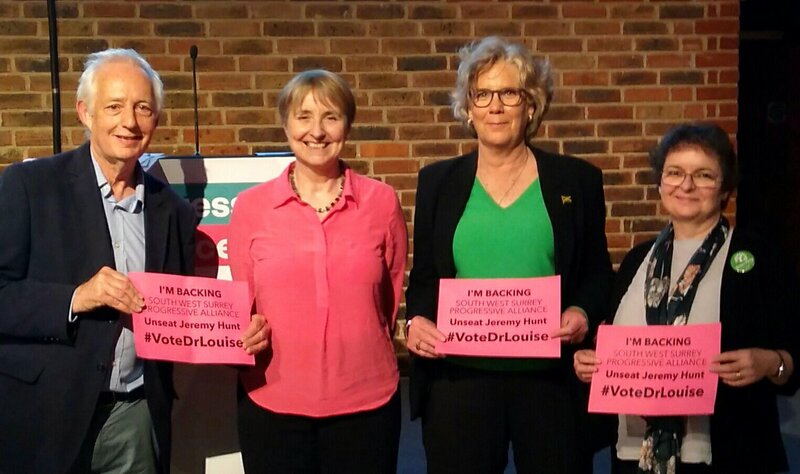 Locally Greens, LibDems and Labour all wanted to stand their candidates down and unite to support Dr Irvine. The Labour leadership has stupidly expelled the Godalming three and imposed a candidate on the constituency. Looks like the LibDems are also putting up a candidate. As far as I can see the only way of defeating the right wing BluKip hegemony with their big money backers is by very much greater cooperation in some kind of progressive alliance. The Progressive Alliance is having a launch event in London tomorrow, Monday 15th May. Many Labour and LibDems members are supportive, but the leadership seem reluctant to stand their own candidates down and support rival candidates. The Green Party is much more wholeheartedly in favour. The situation is still fast moving and it may yet be the case that the spirit of cooperation will prevail. In many constituencies the number of people who do not vote exceeds the numbers who vote for the winning candidates. If we can get these non-voters, and especially the young non-voters, to register to vote, and to vote, then maybe a miracle can be achieved and we can get rid of this ghastly government. In the meantime I’ll be busy helping in Herefordshire, where we have two great Green candidates, Diana Toynbee and Ellie Chowns, and with a couple more miracles they might win on 8th June! This entry was posted in Politics on 14 May 2017 by Richard.